Content is all sorts of things — blogs, posts, pages, information, pictures, all sorts – and it needs to be improved periodically. These posts may even be put on Linked, Facebook or Google+, but it needs to be effective. There are millions and millions of websites that give the reader the choice, and you want them to be impressed with yours. So let’s make them look a little bit more professional. 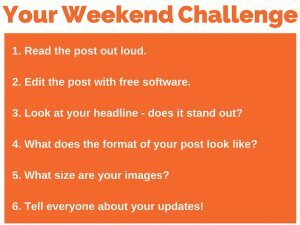 Now, for anyone who has been following me for a while, you will know that this is the Friday edition, it’s the weekend challenge where I give you something to think about over the weekend. It gets you away from the normal work but in between time when you’ve got five minutes when you are desperate to do some work, you can work through this. So the six easy steps are going to be written down, so go get your pen, go get your piece of paper, or a pad or even a pencil and let’s get started. 1. Read your post out loud: Yes, it may sound silly, but read it out aloud. Now I don’t recommend you do that when other people are around and I don’t mean while you’re walking down the street. By reading it, you get to hear how it sounds in real life; you will also get to find a few little errors and little mistakes. One thing you are looking for is to cut out the waffle and repetitiveness. When I say “waffle” by the way, that’s possibly an English term, so, I mean, just blabbering on about any old thing. Get to the point, the reader hasn’t got much time, okay? 2. Edit your post with free software: First of all, use Grammarly. Now we use it primarily for every post. We run everything through it. In fact, I have it constantly running in Google Chrome, in my browser on my Mac. Simply enter your post in and you will find it will analyze it, and it will take out places where you should have commas or where you shouldn’t have commas, where you’ve got the wrong “there or their”, the wrong “here or hear”, or things like that. Now, once you’ve gone through Grammarly, I want you to then copy the same piece and paste it into Hemingway. Both of these are free tools, so just follow what they say, follow the advice and do it. 3. 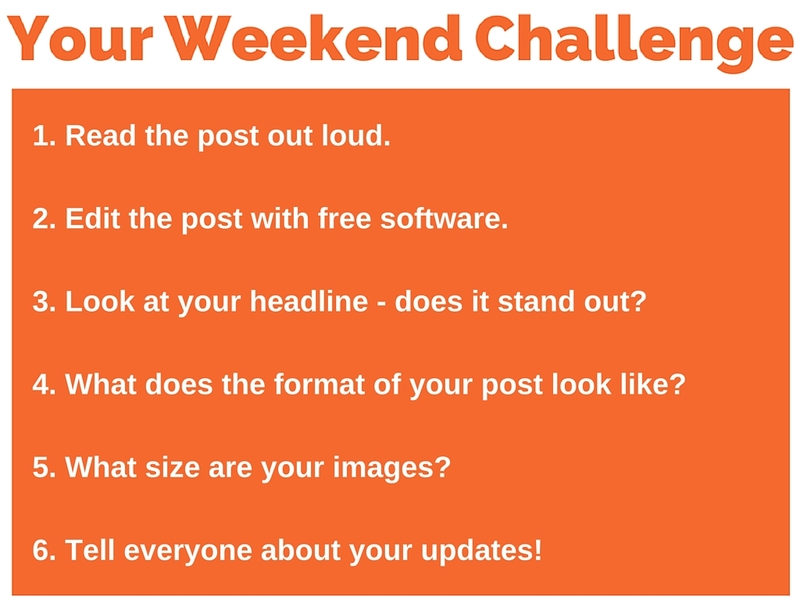 Does your headline stand out: If people read your headline and it isn’t appealing, they won’t go and read your article or your post in the first place, so it doesn’t matter how good your writing is. Now copywriters spend something like 80% of their time and effort just on the headline. Once you get people through into the article, that’s half the battle. So make it more effective, use powerful words. Look up Jon Morrow, his website is boostblogtraffic.com; now when you get to his website, he has some excellent articles on how to form a good headline, but he is just darn good at writing them. On the right hand side I think of his website, down the sidebar, there are the popular posts, just look at the headlines of his popular posts and how easy they are to read. You can also Google about good headline formats as well, but make them effective. 4. What does your format look like? : Now this is one of my top pet peeves. On websites in web copy, I just cannot stand to see huge blocks of text in long paragraphs. To me, that is boring and it’s unappealing. I don’t want to read them. You want shorter paragraphs, so make sure they have shorter words. This would probably have come out when you use the Hemingway app, along with shorter sentences. So shorter sentences, shorter words, shorter paragraphs. Now, this is not an English lesson at school, so you don’t have to worry about your grammar teacher coming in and hitting your knuckles with the ruler. Just write for real life, because people speak in real life in a different way, they read in a different way. This is the 21st century full of lazy people who are used to the Internet and scanning. If you look at an article with lots of text you would be bored, but if you look at an article where you can scan through it because it’s got bullet points and short paragraph with only one or two sentences, it makes it much, much easier. So work on that, work on the format and make it easy. Another one is to add sub headers or sub headlines, again in bold, because bold stands out and they give the reader an idea of what is in that section. When they are scanning ahead, they want to know whether it’s worth their time, they’re not going to read the whole thing in detail. They are going to look for scannable bits, so make sure there are plenty of them in the article. 5. How big are your images? : Your images need to be large. These days everyone’s got a fantastic camera on their smart phone, or you might even have a proper DSLR camera like a Canon or a Nikon. Plus, there are stock image sites with free stock images, places like pixabay.com, or unsplash.com, which are two of my favorite stock image sites. And that of course is, the paid stock photography sites, you’ve got no excuse. Make sure those images are huge. People want to pin them on Pinterest, and people want to see things on Facebook with images. They also want to see tweets with images on Twitter. It’s the modern world, it’s the way we go, everything with an image gets far more shares, including your post, so make sure they have got nice fresh images. The one at the top of the post, the first one, make it big enough to be pinned. So, something like 725 pixels wide, 1000 pixels high, then put text on top. Go to canva.com, which it is free and easy to use, to add text to your photos. Canva has loads of tutorials. Put something like the headline of the article over the text or grab a quote from in the article, just a quotable piece in simple text, that’s what people like to share. You’ve seen quotes on Facebook, they’re everywhere because people like to share things like that. Improve your images. And by the way, don’t just put one at the top and don’t keep them over to the right or to the left, put them full width, put a few images in. If you’ve got an article that is around 900 words, put one image for every 300 words, maybe even a couple more. Don’t get stuck with that. 6. Time to tell everyone about your updates: Don’t just post it and share it on Facebook or tweet it and then hope that that’s it, your job done. Assume people aren’t going to come unless you tell them you’ve got new content; big mistake that people make is not telling enough people that they have written new content. So when you put something out there, please, please, please, please tell them all about it. This can be by e-mailing your list, your customers, your potential customers, tell them, or an influencer list that you have built up over time. 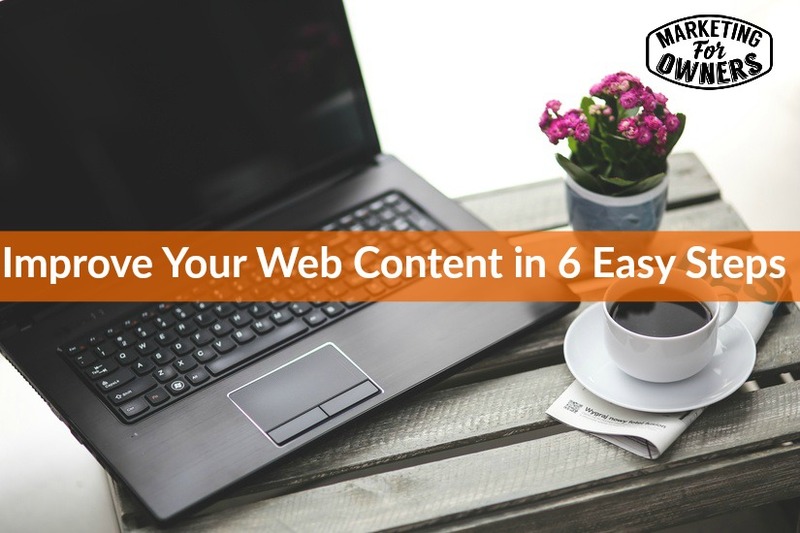 And that’s it, those are six simple steps to improve your content. And they really, really do work. If you get that into a habit, make a checklist, walk through them each time, your content would be so much more readable,and people will share it, people will come back for more. That’s it, weekend challenge done. Once you’ve done, enjoy the rest of the weekend with your family, don’t do any other work, and come back refreshed on Monday. Which of these 6 will you start with first?